Plants are the Strangest People: Anthurium no. 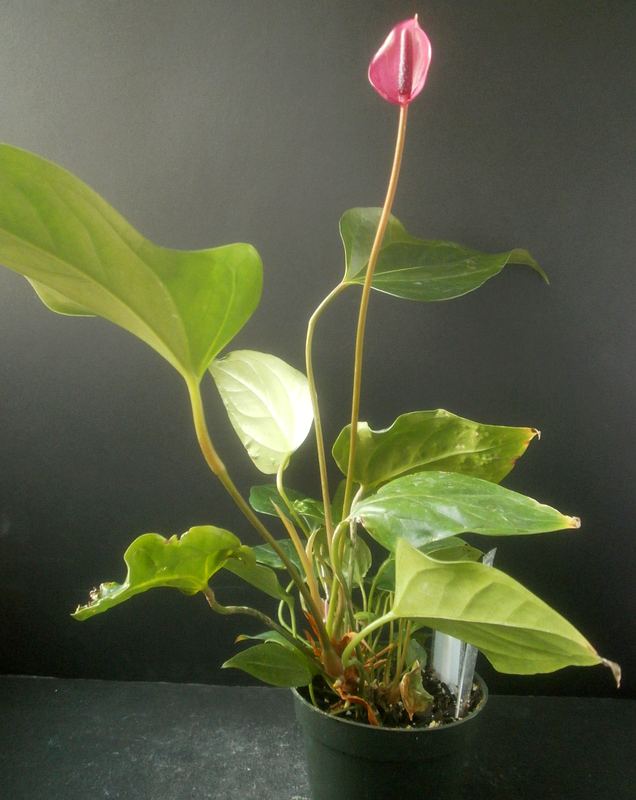 0386: "Violet Chachki"
Anthurium no. 0386: "Violet Chachki"
I said a while back that I had a list of drag queen names that were unusable, because they imply a color, and I can't know what color my plants are going to bloom before I name them, so in order to use that set of names, I'd have to wait until a plant with a crappy name bloomed and then swap the names with something color-appropriate. I didn't figure that would happen anytime soon, and was somewhat resistant to the idea because of all the paperwork I'd have to do to make the name change official, but then seedling 0386 bloomed, and it seemed like a really good time to find out how much of a hassle that would really be. 0386's original name was "Bjorn Innabarn," which seemed good enough at first but grated on me the more I used it, and then he turned out to bloom in purple. Well, that's obviously not going to happen all the time, and I figured I'd wind up talking about 0386 a lot because of the unusual color, and the idea of seeing and typing "Bjorn Innabarn" a lot was unpleasant. Hence, "Violet Chachki." The paperwork wasn't that bad. Violet's buds are maybe prettier and more interesting than the actual blooms are; they're at least a better shade of purple. 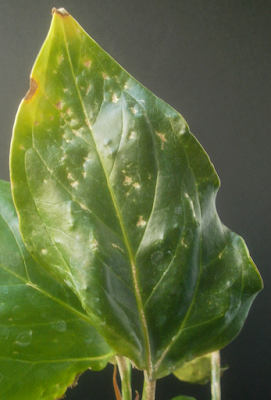 Once the spathes open, they wind up receiving some thrips damage. For the moment, Violet's the only genuinely purple purple in bloom. 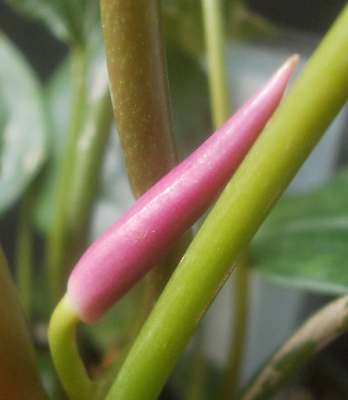 Her seed parent, the NOID purple, is still technically alive, but in a much-reduced form that's not likely to bloom anytime soon.1 0200 "Mario Speedwagon" did get around to making a new bud, after keeping me waiting for about a year, but the bud got snapped off accidentally during the shelf restructuring. And 'Joli' has a purple bloom too, but its blooms fade to pink pretty quickly, plus it's having thrips troubles, so the blooms usually don't look very good. So Violet currently has the weight of representing the entire purple-blooming community on her petioles. Which is a lot to ask of a seedling who's only 29 months old. but the newest ones have been a lot better, so whatever the problem was, she seems to be growing out of it. And the overall plant is merely okay, but I moved her to a bigger pot, so that should improve soon as well. There's already a second bud (not visible in the below picture, but trust me). So: Violet could be better, but there's reason for optimism. Mostly I'm just relieved to see another chance to hang on to any of the NOID purple's genes; it never produced very many seeds to begin with, and its offspring are terrible at staying alive. I have no blooms or buds from the NOID purple that could produce new seeds, at the moment. There are no seeds still in the germination containers, waiting to be potted up. Of those that were potted up, only 31% survive past the two-year mark. 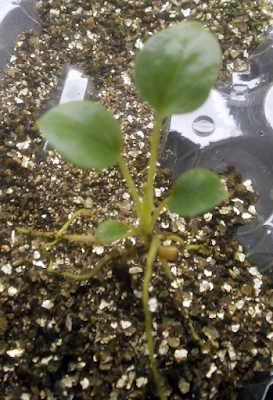 So as of 12 September, the genetic legacy of the NOID purple rests on 19 seedlings, several of which are all but certain to die before blooming.2 So any seedlings that survive long enough to bloom are pretty important. I don't know yet whether this is something they'll grow out of or not; the twelve I've potted up so far look fairly normal (though the long-petiole thing does seem to be fairly consistent, and they appear to sucker a lot more than the typical seedling), but then I probably chose to pot up the most normal-looking ones I could find, too. 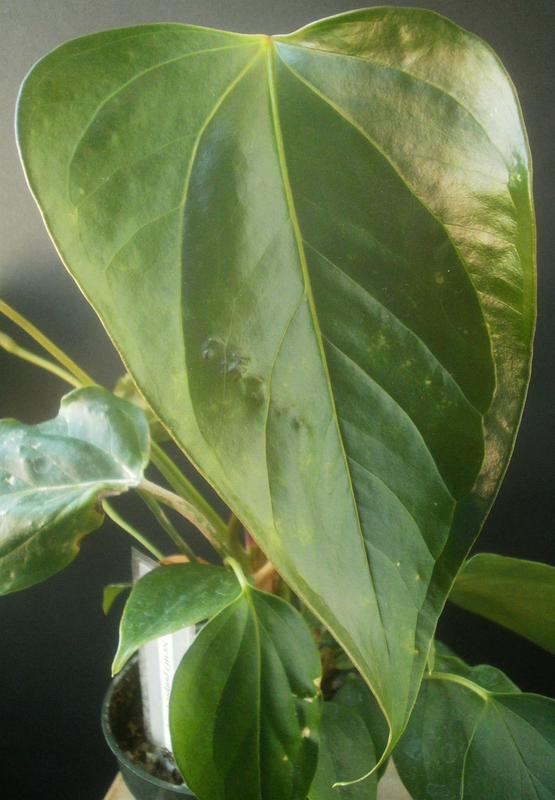 So maybe I shouldn't abandon all hope of a nice dark purple bloom, but I'm glad that's not my only Anthurium-related goal, 'cause it looks like it's going to be a lot of trouble. 1 The original plant was on the verge of collapse, possibly from being overpotted, so I cut it back to the soil line and tried to root the tops in water. This worked well enough to get me one pretty sparse-looking 4- or 5-inch pot, but it hasn't grown much or tried to bud, so I don't have high hopes for it. The original plant has sprouted a couple new growing tips from the stump, which is good news, but it'll be a while before they're big enough to consider blooming, and since I haven't moved the plant to a smaller pot (for fear that doing so would disrupt whatever recovery process is happening), it seems like there's a good chance of it rotting before it blooms anyway. 2 It's possible that the NOID purple might have produced pollen at some point, in which case some of its genes would be out there but hidden from me. I don't recall it producing pollen, but by this point I barely recall it blooming at all. So there's a sliver of pollen-related hope. Chris is doing well enough so far, I guess. He's not obviously unhappy about anything, and the thrips seem to be leaving it more or less alone. 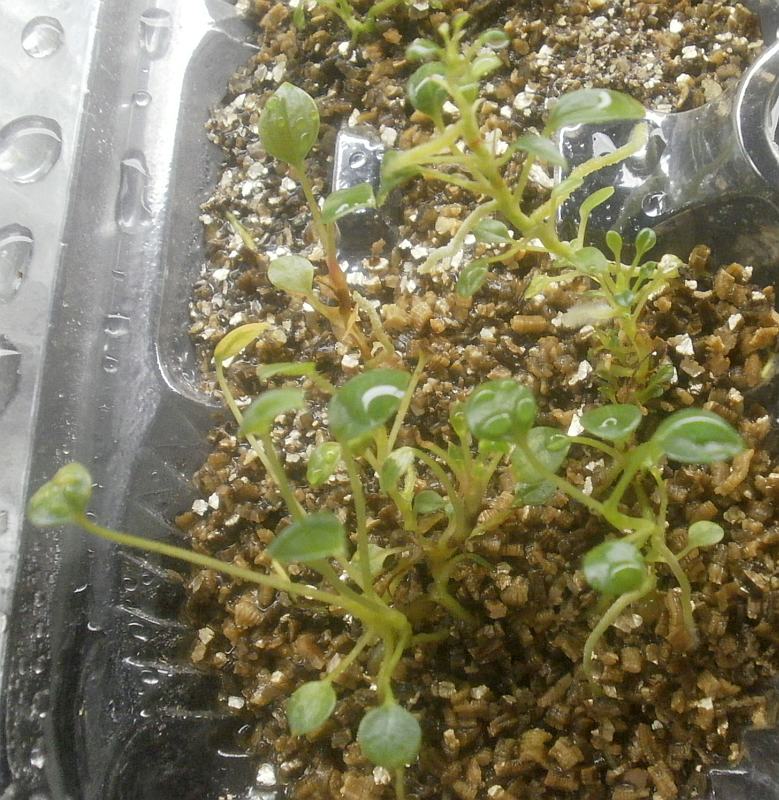 Also some of the seeds were started recently enough that they might yet germinate and develop well, or grow into something more vigorous-looking, so the situation may not be as dire as it looks. But the seeds started in March and April had an 11% germination rate overall, with only a single seedling that looked strong at all (which was Chris). So 'Joli' is less useful than I'd hoped. 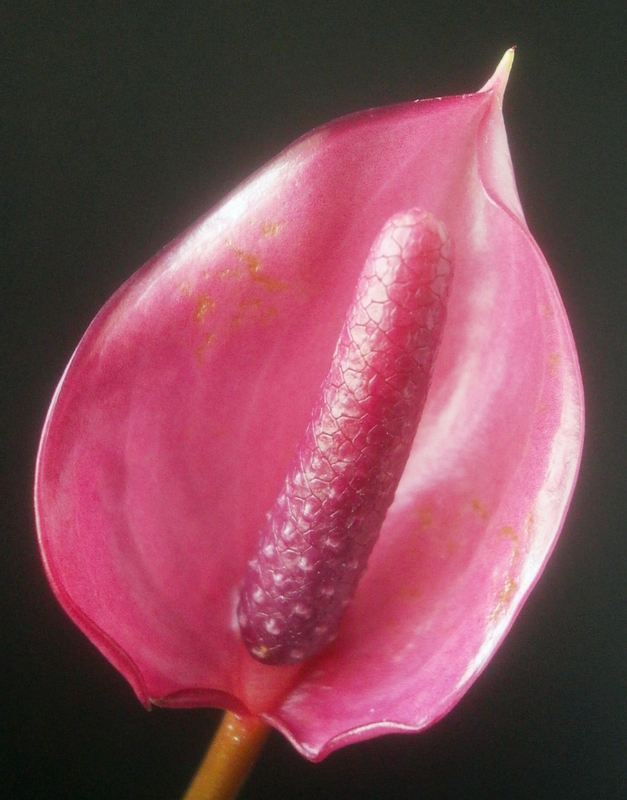 Anthurium no. 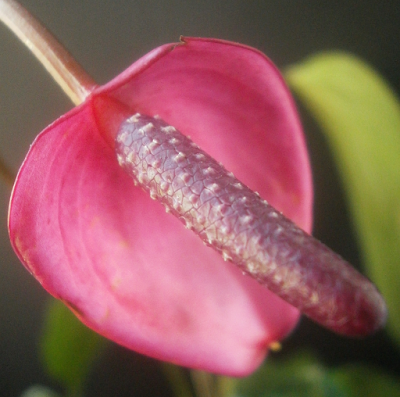 0558 "Amber Waves"
Anthurium no. 0416 "Holy McGrail"